The idea came to me while I was making ice cream. 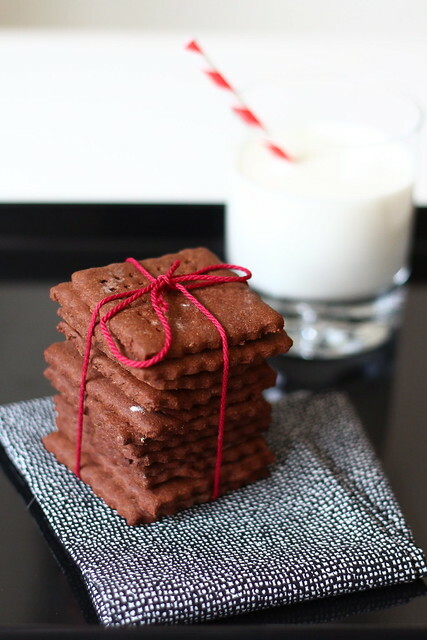 A few days prior, I asked Gabe what kind of ice cream he had a hankering for, and he replied, “cookies ‘n’ cream!” So of course I made a whole bunch of chocolate wafer cookies using this recipe, instead of buying oreos to mix into the ice cream. As I was transferring the cookies from the baking sheet to the cooling rack– and a few just happened to make their way into my mouth for quality control– I had a memory, and then an epiphany. So I studied the tweaks I had made to previous graham cracker recipes, did a little research about cocoa powder, and developed a recipe that was dark and chocolatey but made with 100% whole wheat flour. Something that would taste fantastic on its own but sublime with a dollop of peanut butter. Something to please my taste buds and my conscience. And here it is. In small bowl or glass measuring cup, stir together honey, milk, and vanilla extract. Add to the flour mixture and stir just until the dough comes together. Cover bowl and place in refrigerator for at least an hour. Meanwhile, preheat oven to 350° F. Line two baking sheets with parchment paper and set aside. Remove dough from fridge and roll out half onto a lightly floured surface, about 1/8-inch thick. With a knife or pastry wheel, slice into 2-inch by 2-inch squares. Place on parchment-lined baking sheets and lightly poke with a skewer or other kitchen tool to make a dotted pattern. (Believe it or not, I use the poky side of a meat tenderizer.) Bake for 8-10 minutes. Let cool on baking sheets for a couple minutes, then let cool completely on a wire rack. Repeat with other half of dough. Makes approximately 4 dozen crackers. Source: A Lingonberry Jam original, inspired by these cookies and my previous adaptation of a Smitten Kitchen recipe. When I saw this recipe in the Jerusalem cookbook, it immediately caught my eye. Who doesn’t love falafel? As I read over the recipe instructions, I was even more excited to see that the authors specifically called for the mixture to be ground using a meat grinder. Being the proud (recent) owner of one of these contraptions, I jumped at the opportunity to use it again, this time for something other than hamburger. Making homemade falafel also fulfilled a couple of my ongoing 2014 food resolutions: make things from scratch, scratchier; and expand my cultural culinary horizons. It also sort of helped me keep working toward my goal of only purchasing humanely raised meat by adding another great vegetarian recipe to the repertoire. I call that a win-win-win. Note: This is the final part of my recent composite recipe series. 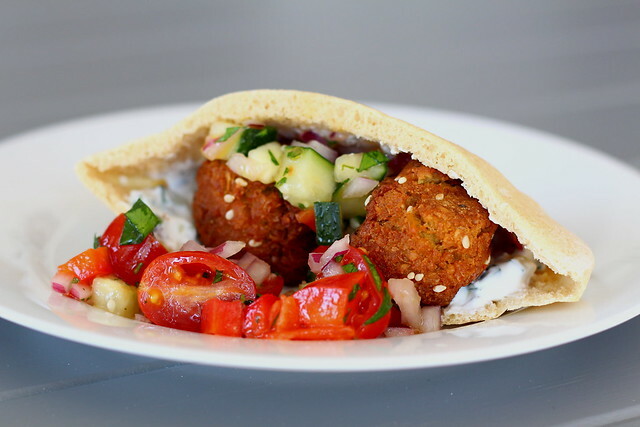 If you want to be crazy like me and go all-out, serve this falafel with homemade pita bread, Israeli salad, and tzatziki. The various components of this recipe can be made a day or two ahead. Or you can pull a Krista and make them all in one evening… and eat dinner at 8:00 at night. Up to you! The night before you plan to eat the falafel, place dried chickpeas in a medium bowl and cover with 2 1/2 cups water. Cover bowl and set aside to let soak overnight. Remove falafel mixture from refrigerator and form into small patties or balls, about 1 1/2 inches in diameter. You might need to wet your hands for this step if the mixture is sticky. Sprinkle with sesame seeds. While shaping the patties, heat oil in a medium saucepan or dutch oven with high sides. The oil should be at least an inch deep, preferably two. Heat the oil to 350° F.
Fry the falafel in the hot oil in batches, until dark golden brown and cooked through. Drain on a plate with paper towels. Serve immediately, preferably in fresh pita with tzatziki and Israeli salad. Source: Slightly adapted from Jerusalem by Yotam Ottolenghi and Sami Tamimi. 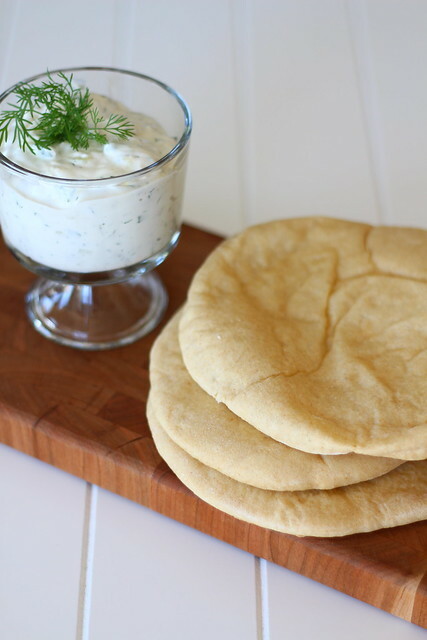 So I realized a little while ago that I had alluded to making pita before on this blog, but I hadn’t actually posted the recipe. Ay dios mio! I’m sure you were all on the edge of your seats just waiting for a pita bread recipe. So here you go! Pita is actually an incredibly easy thing to make, and homemade pita is leaps and bounds better than the dried out store-bought stuff. I used to dutifully take whole wheat pita pocket sandwiches stuffed with tuna salad for lunch, but now I actually look forward to eating it. Because it’s supposed to be delicious! Note: This recipe is part two of my latest composite recipe series. See part one, Israeli salad, here. There’s one more post coming. Can you guess what the final recipe will be? Punch down dough and divide into eight equal pieces. Form each piece into a ball. Cover with a damp towel and let rest for 20 minutes. Meanwhile, preheat oven to 400° F with a pizza stone set on the bottom rack. Roll out each piece of dough on a lightly floured surface into a round shape about 1/4-inch thick. Working with two to three pieces at a time, place rolled-out dough onto the heated pizza stone and bake for 4-6 minutes, or until puffed and golden. Remove from pizza stone and place on a plate. Repeat with remaining dough. Serve immediately. As this long winter has drawn to a close, I’ve found myself craving the colorful produce of summer. Remember those days? When I was actually growing fresh dill, mint, and jalapeños on my tiny city balcony? Kirby misses the catnip, for sure, and I miss everything else. Alas, winter tomatoes are not the same as summer tomatoes, so I swapped out some nice looking cherry tomatoes from the grocery store in this dish. Extra points to whoever can guess what I served with this Israeli salad on a recent sunny-and-getting-sunnier March evening! 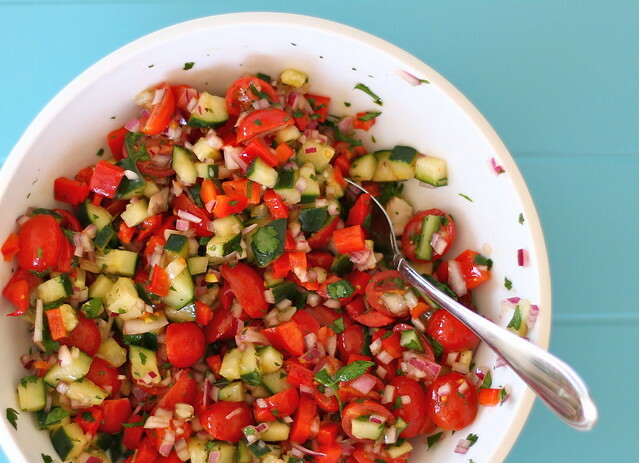 In large bowl, stir together cucumber, tomatoes, red bell pepper, red onion, and parsley. In small bowl or measuring cup, whisk together olive oil, lemon juice, vinegar, garlic, sugar, mustard, and salt and pepper, to taste. Pour dressing over vegetables and toss to coat well. Serve immediately. Source: Adapted from Jerusalem by Yotam Ottolenghi and Sami Tamimi. Despite the plethora of ice cream recipes on this blog, I’m more of a salty person than a sweet person. Not personality-wise, but taste-wise. (Ahem.) So when I saw a recipe for peanut butter granola in The New Midwestern Table, I pasted a sticky note on the page immediately. This girl likes her breakfasts savory. 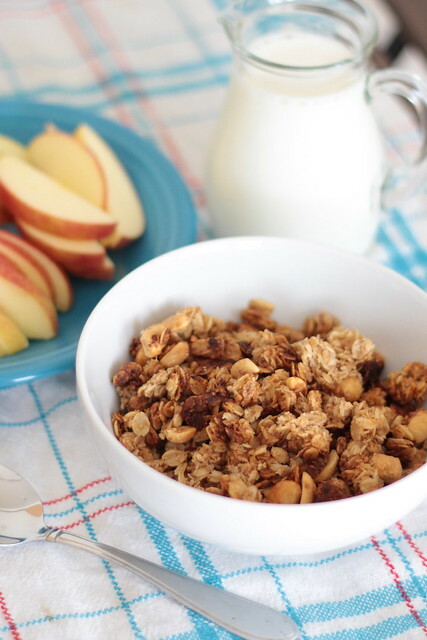 This granola certainly delivers a salty/savory breakfast punch. You can stir in dried fruit right after it comes out of the oven for a bit of sweetness, or leave it as-is. You could even douse it in chocolate syrup. (I’m kidding. This is breakfast.) But if you love peanut butter and/or reliving your hippie days, try this granola stat! Preheat oven to 325° F. Line a jelly roll pan with parchment paper or foil and set aside. Melt butter in large saucepan over medium heat. Continue cooking until the foam turns amber in color. Remove from heat and stir in peanut butter, honey, water, salt, and cinnamon until smooth. Stir in oats, wheat germ, coconut, and peanuts. Spread granola onto prepared baking sheet. Bake for 15 minutes, remove from oven, and stir. Return to oven and bake an additional 5-10 minutes, or until golden brown. Remove from oven and let cool on baking sheet. Store in an airtight container for up to two weeks. Source: Adapted from The New Midwestern Table by Amy Thielen.